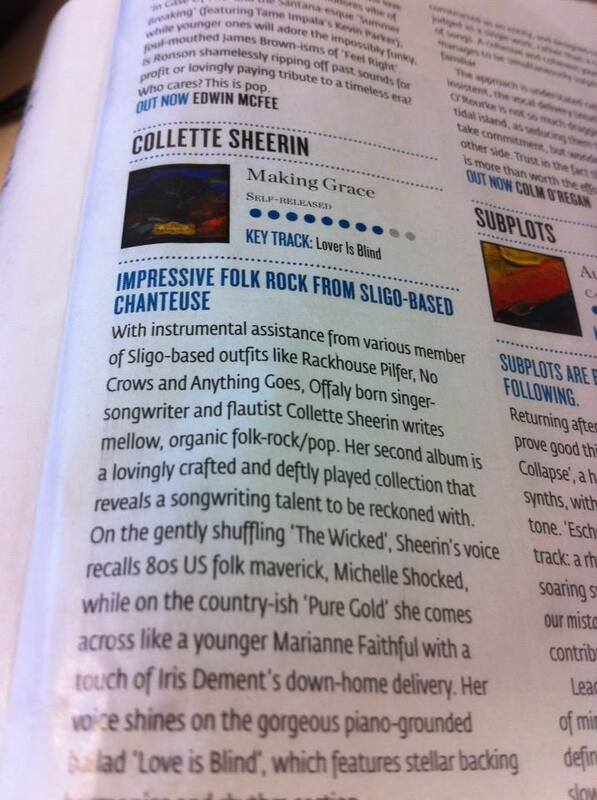 Collette Sheerin Making Grace 8/10. With instrumental assistance from various members of Sligo-based outfits like Rackhouse Pilfer, No Crows and Anything Goes, Offaly born singer songwriter and flautist Collette Sheerin writes mellow, organic folk rock/pop. Her second album is a lovingly crafted and deftly played collection that reveals a songwriting talent to be reckoned with. On the gently shuffling “The Wicked”, Sheerin’s voice recalls 80’s US folk maverick, Michelle Shoked, while on the country-ish “Pure Gold” she comes across like a younger Marianne Faithful with a touch of Iris Dement’s down-home delivery. Her voice shines on the gorgeous piano grounded ballad “Love is Blind”, which features stellar backing harmonies and rhythm section. Elsewhere, “Two for Joy” is a jaunty, up tempo folk tune, while the bluesy “Little Apples” showcases yet another side to her versatility. The closing title track, an instrumental, appears to be inspired at least in part by Led Zep’s “Stairway to Heaven” and features a lovely descending guitar pattern, mellifluous flute and tin whistle. Worth hearing. Colm O’Hare – HOT PRESS MAGAZINE. by Seamie O’Dowd. May, 2011. Collette Sheerin’s flute playing and singing have been a prominent part of Sligo’s music scene since she came from her native County Offaly to live here quite a few years ago. She is joined on this album by Sligo based guitarist Shane Reynolds who also plays banjo and shruti, Swiss born Sligo resident Anna Houston on cello and mandolin, Sligo guitarist Leslie Jones, Niall Sheerin on bodhran and the internationally renowned Steve Wickham on fiddle. The album was recorded by Sligo musician Duane Gallagher and mixing and mastering was done by Michael Gormley, also a musician from Sligo. The album opens with a gentle groove, courtesy of Shane (on guitar) ushering in a jig called Margaret’s Garden, composed by Collette (as are most of the tunes and songs on this offering). The cello brings out a strong baroque feel in the first tune of this set. The second, The Croghan Hill Jig, in the bright sounding key of G, is more reminiscent of an older style of Sligo or Leitrim tune and contrasts beautifully with the first tune. The title track, Take Your Colours, features Collette’s vocals and, like much of the song material here, is reminiscent of the folk singing of the sixties and seventies. This song, as do all the songs on this album, contrasts considerably with the more antiquated feel of many of the tunes, and the album is none the worse for that. It’s an interesting juxtaposition of musical styles, very much in keeping with the melting pot that is Sligo, which is the breeding ground for a lot of what’s happening on this album. Marianne’s Demise is, for me, the album’s stand out track. It’s a beautiful tune that has already been covered by Sligo based quartet No Crows and already sounds like it’s been played and refined over a century or two. In her playing of this self-penned tune, Collette brings the emotion of the story that inspired the tune to the fore, her flute playing communicating much like a child on your doorstep telling you about finding a lost kitten. Shane’s guitar playing is quite rock influenced and brings a dark element to the music, very much in keeping with the story, while Anna’s cello gives an historical context to the sound. Sunny Spells evokes the spirit of Sandy Denny, while Collette’s version of Leonard Cohen’s Dance Me To The End of Love renders her fear of possible sacrilege, which she modestly expressed on the sleeve notes, entirely redundant. Three reels on whistle follow, beautifully played with Shane and Niall. These are the only tunes that Collette didn’t write on this CD. Love and Question is sung to the sole accompaniment of a crackling fire and is well placed on this album. 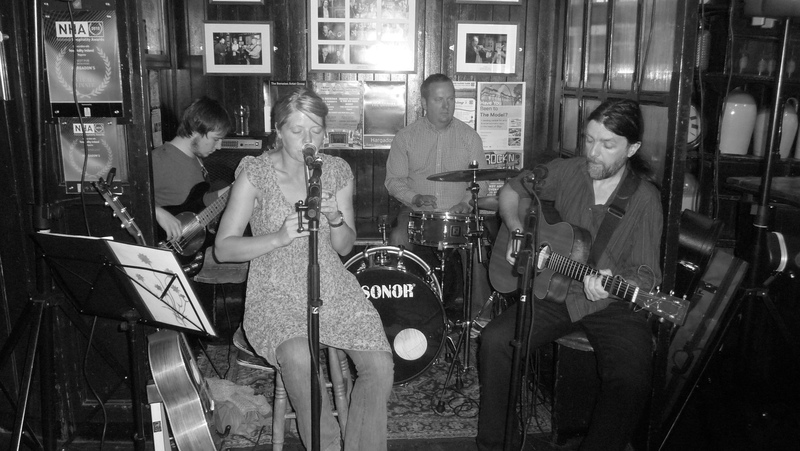 The album closes with a set of tunes called Bluebells, dedicated to Anna Houston, Felip Carbonell, Eddie Lee and Steve Wickham aka No Crows, and their influence is very evident here, not least because of Steve Wickham and Anna’s musical contribution, which augment Collette’s flute playing, Shane’s guitar playing and Niall’s bodhran playing. 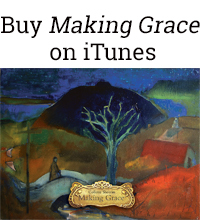 Taken as a whole, the album is quite earthy in terms of production as well as vocal and instrumental expression. There is definitely musical sweetness, but it is totally devoid of any traces of saccharine. This is the musical equivalent of what you find when you strip away a false economy, smoke, mirrors, or short term trends – that element called substance.